Advertisers, marketers and public relations experts strive to get a message across as clearly, cleverly and effectively as possible. Recently, a new adjective is making its way into that list -- natively. Native advertising takes an advertising message and marries it to a platform that consumers are already engaged with. Take Chipotle’s recent “Farmed and Dangerous” web series on Hulu. Chipotle produced and sponsored this comical satire of shady big-food PR practices, which quickly won over viewers (as of Apr 2, 2014, it boasted an 8 user rating on IMDB). The series exists alongside Hulu’s other content and doesn’t feel like a pushy advertisement. “Farm and Dangerous” simultaneously promotes Chipotle’s food with integrity mission statement, while entertaining on a platform that its consumers frequently use. In an ever more competitive advertising world, marketers are increasingly turning to native content to capture the eye of consumers. Here are five tips and best practices on how to keep your advertising native, engaging and effective. 1. Go social. Having a robust social-media presence on all of the major platforms is a must but native advertising allows advertisers to directly reach consumers on platforms they already use. For instance, Facebook’s news feed ads and Twitter’s promoted tweets place branded content right in the middle of the social experience. Facebook’s billion-plus users spend 40% of their time in the News Feed. Twitter registers around 150 billion timeline views per quarter across 230 million users. Instagram, Pinterest, and even LinkedIn have begun rolling out native advertising solutions, as well. 2. Aim for your audience. Understanding your audience and tailoring a campaign to it isn’t specific to native advertising, but it might be the most important part of creating a native-advertising campaign. Knowing where your customers live, what they do and how they interact with your brand is as important as crafting an appealing message. For example, DoubleTree by Hilton created a native campaign on Twitter that coupled a brilliant idea with geographic targeting. The Shorty Award-nominated campaign sent iconic London cabs with DoubleTree branding around the city while promoting the hashtag #DoubleTreeTaxi and a contest to win free hotel stays among UK residents. 4. Get Visual. Visual content, such as infographics and data visualizations, generates 30 times more traffic than text articles, meaning native advertising campaigns that include a visual component are far more likely to be successful than those without one. The Huffington Post wisely couples short articles with infographics that help advertisers tap into The Huff Post’s massive readership. For example, they used the Visually Marketplace to create an infographic promoting Sundance Channel’s Dream School that generated nearly 300 comments and more than 2,000 social media shares. 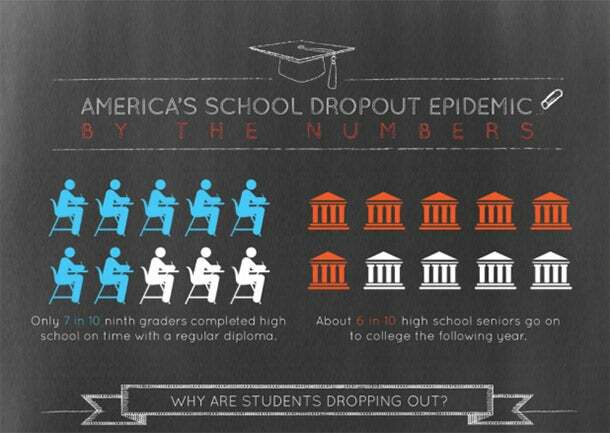 America's School Dropout Epidemic by the Numbers. Click on the image for the full infographic. 5. Embrace the sponsorship. Native advertising is a smart way for sites to add content and for advertisers to spread their messages on a publishing platform. What it’s not meant to do is to trick readers into thinking promoted content is the same as editorial content. A poorly executed advertorial for the Church of Scientology on The Atlantic’s website had both the church and the site in hot water. In The Interactive Advertising Bureau’s native-advertising playbook, disclosure is a key principle: “Simply put: Regardless of context, a reasonable consumer should be able to distinguish between what is paid advertising vs. what is publisher editorial content.” Embracing the sponsorship with a simple button or tab provides added exposure for your brand and aligns with the IAB guidelines.